Need to get rid of Yellow Jackets? Many people still think yellow jackets are bees. Not true; they are wasps. Like bees, they are great pollinators and quite effective at controlling garden pests. However, yellow jackets nest in large colonies and can be aggressive and intrusive, thus making them a potential concern. You’ve probably seen them at family barbecues. They perch on soda cans and circle garbage bins. They don’t prefer ‘human food’, nor do they enjoy stinging humans (not that we know!). They only go after human food when their own food supply runs low, and sting when the nest feels threatened. Their natural diet consists of caterpillars, spiders, flies…mostly garden pests. In a way, they’re a form of free pest control! They also like sugary drinks and floral perfumes/skin lotions – so, you may want to avoid those if yellow jackets are present, or suspected to be around. They are sensitive to sound, and easily provoked by vibrations – if you discover a nest in your yard, we recommend avoiding the area if possible and if not the nest needs to be removed. Yellow jackets are aggressive insects. They form large underground nests, and their population grows as the weather gets warmer. While the ground is a common nesting area, they also nest in bushes, building cracks, sidewalks, and beneath porch steps, to name a few places. Some nests have been estimated at 100,000 workers. This can be quite a problem for summer yard parties. If you see one, don’t swat! They are quick to react. If one lands on you, do your best to simply brush it off and walk away. If you are stung, however, you will want to move away quickly. Yellow jackets can leave a chemical that marks you as the enemy, which incites others to attack. They often attack in groups, and can chase you for long distances. And, also, unlike bees, they can sting multiple times. Once you’re safe, try to get some vinegar on the sting. A combination of baking soda and water is another popular homemade remedy. The acid neutralizes the venom. Ice, aspirin, and Ibuprofen all help to ease swelling and pain. If you see large quantities of yellow jackets, you may want the issue addressed. Their numbers go down naturally towards the end of summer, as males can’t survive the cold, however they become very aggressive toward the end of their season. However, if you want a nest removed, do not take the responsibility on yourself. 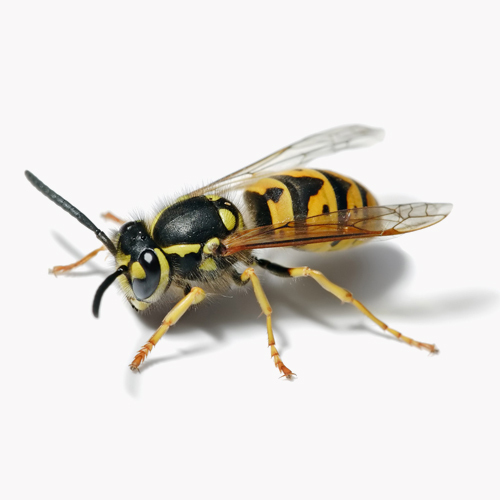 As we mentioned, one nest can have up to thousands of yellow jackets, and tampering with them can result in serious harm. If your yellow jacket nest is uncomfortably large and active, contact the Bug Man to discuss how to best take care of it, (503) 284-6269.